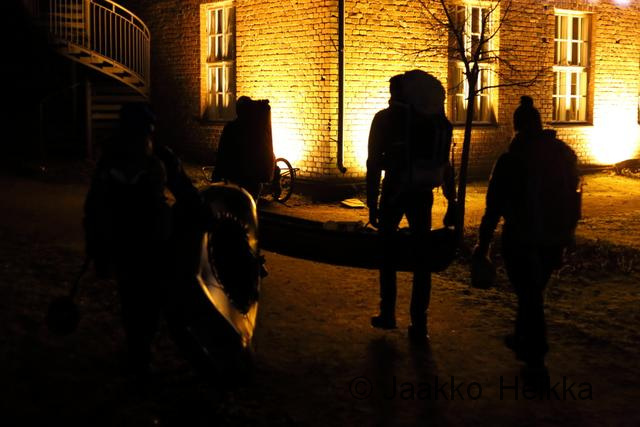 Last Saturday it was once again time for the annual Helsinki Adventure Night, an adventure and climbing oriented movie evening. This year offered an interesting documentary about research work on Antarctica in the form of Antarctica: A Year On Ice, excellent keynote speech from Ueli Steck himself and Valley Uprising, a documentary about the history of modern rock climbing in Yosemite valley. But for some this wasn’t quite enough of an adventure, despite the long queues to the restroom and bar during the intermissions. Photo by Marko Takanen. See the rest of his set by clicking the pic! 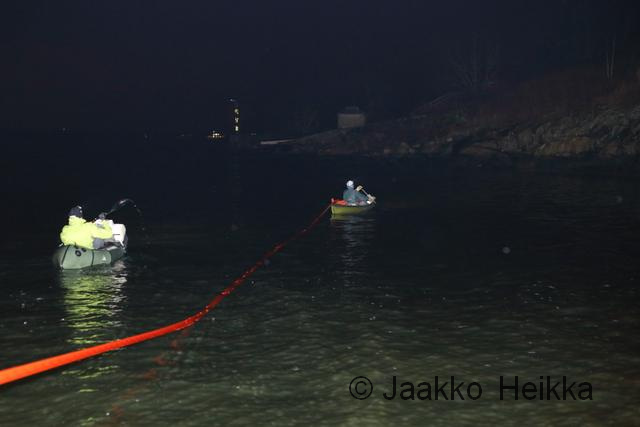 Before the big night Marko suggested on Twitter a proper follow-up adventure for the event and we ended up with a plan involving camping in an island and ferrying ourselves there with couple of small inflatable boats in the middle of the night after the show. Plan was good but my preparations were pretty sloppy: I forgot to take my shell clothing despite the forecasted rain and sleet, I forgot to pack beer and forgot to buy food while shops were still open so only had a bag of marshmallows… But that’s no reason not to go for a little adventure! After the movies a group of five jolly adventurers met outside the theater ready for a little adventure. On the way to the sea-shore I stopped at a fast food restaurant to fill an empty soda bottle at the toilet and buy some sandwiches to grill over fire. Missing water and food covered. The weather was better than expected: around zero and no rain so I was okay without the hardshell. And I also had a little flask of whiskey in my HMG pack so that made up the lack of beer. All covered and ready to go! We met at the shore in Kaivopuisto little after midnight. The party people waiting for a taxi didn’t believe that we were about to ferry ourselves into an island and sleep there under a tarp just for fun. Well, we are all different. If I can choose between an evening in a nightclub or an evening by a camp fire… It’s a no brainer! Very early in the morning we retired side by side under the big tarp. 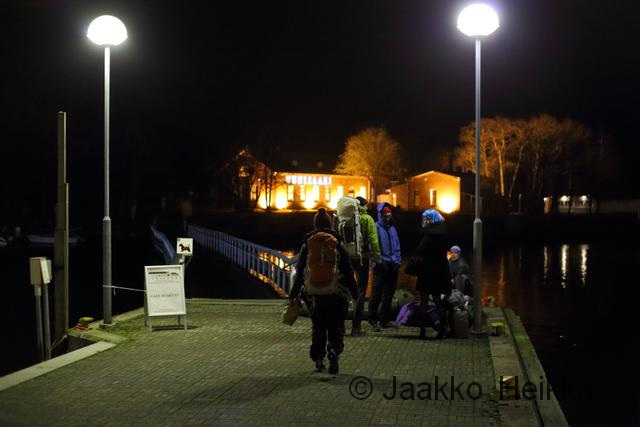 During the night the temperature dropped a bit below zero and some of us had slightly chilly night in their summer bags, me included. Morning was gorgeous with the sun visible for the first time for a couple of weeks. 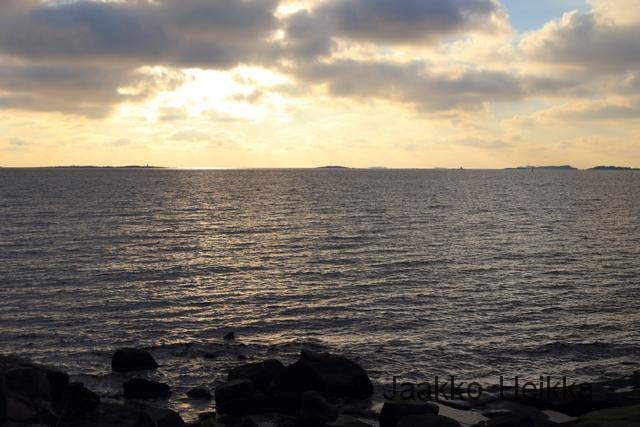 We had coffee and breakfast by the fire and walked around the island to get a good view of it, the sea and the city on the background before ferrying ourselves back to Uunisaari and to the mainland. It was a great little adventure. A proper ending for the Helsinki Adventure Night. I hope there will be a sequel next year! See also Joni’s report and Marko’s photos. When a one-week winter ski tour starts with heavy wind-driven rain you have to remind yourself why you like that stuff. This far I’ve always managed to convince myself that I’m doing what I really like and, fortunately, this time wasn’t an exception. 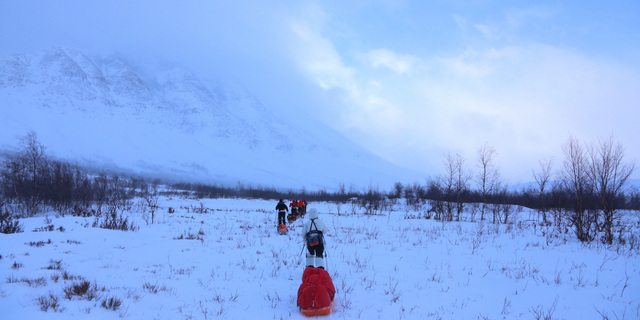 In early March I was in Sarek National Park guiding the Advanced Course in Arctic Ski Expeditions with a great group of nine people. 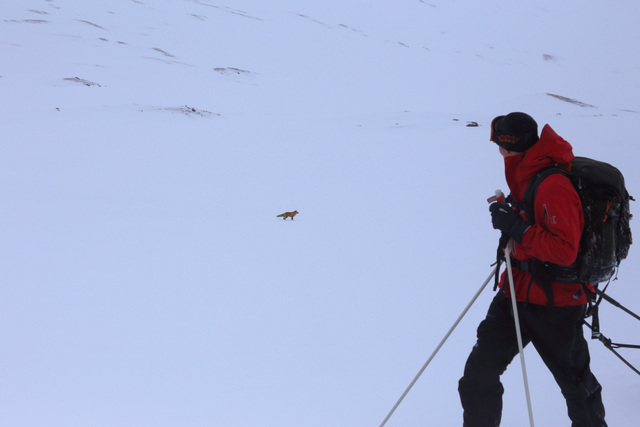 The tour was good but conditions were very unusual and quite challenging. 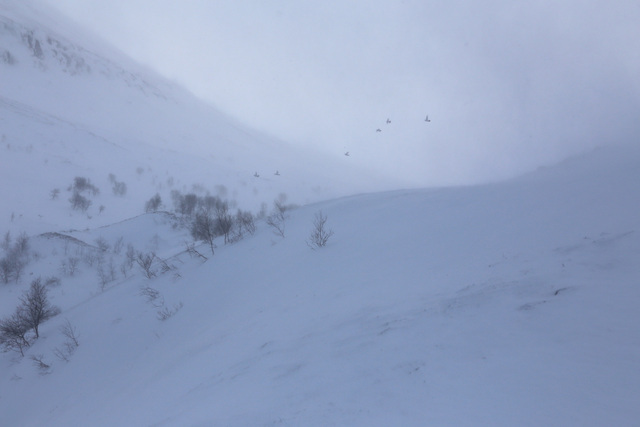 Rock Ptarmigans (Lagopus muta) in storm on the second day of the tour. 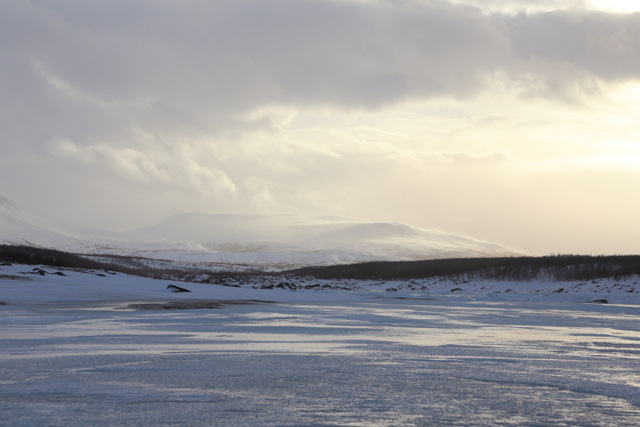 The conditions got interesting already on the approach to Ritsem. 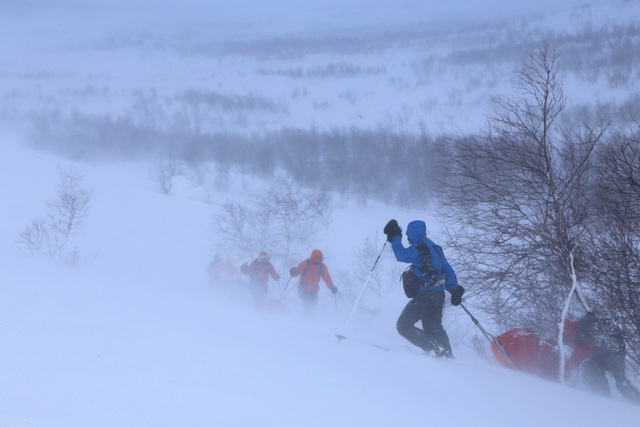 While we were enjoying a late hamburger-based dinner at Gällivare one participant, driving ahead to Ritsem, called on the way to report some serious winds and banks of spindrift. Little bit later he called again reporting flying gravel, wind ripping apart the ski box on top of his car and that he decided to bail and wait for us… Wise decision as the close-by weather station measured 35m/s average and 47m/s gusts! 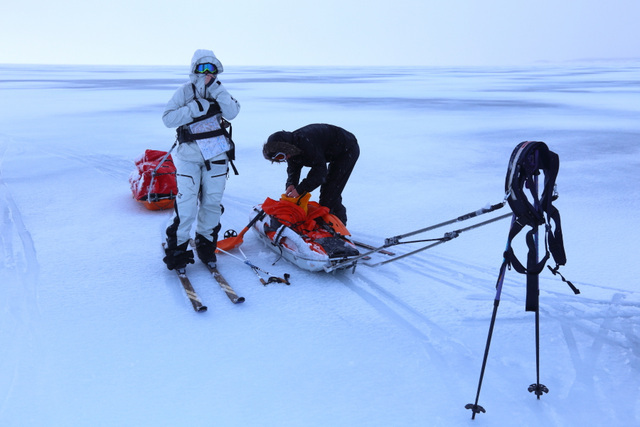 A couple of hours and one serious heart-to-throat spindrift bank push-through later we met at the Stora Sjöfallet hotel, ditched the broken ski box, repacked and headed towards Ritsem. The wind had calmed down a bit and we managed to push to Ritsem were it was eerily calm as the big valley protected the area from the stormy winds. 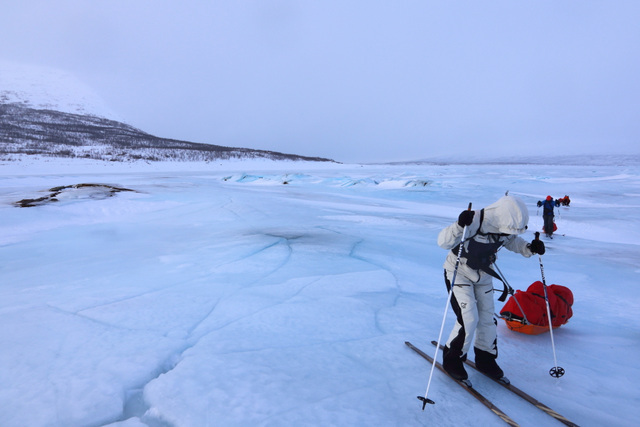 The next morning we got our gear organized and started to ski across the lake Ahkkajaure. A local couple on snowscooters had ventured out early in the morning and returned before we left all soaking wet reporting “terrible weather”. 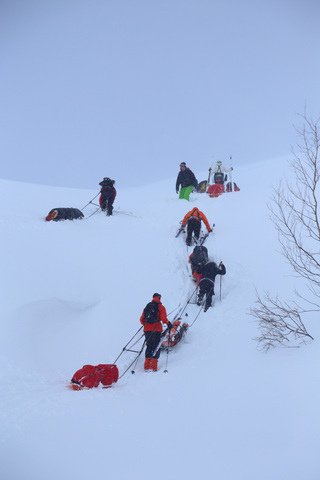 What a great start for a course in demanding ski expeditions! 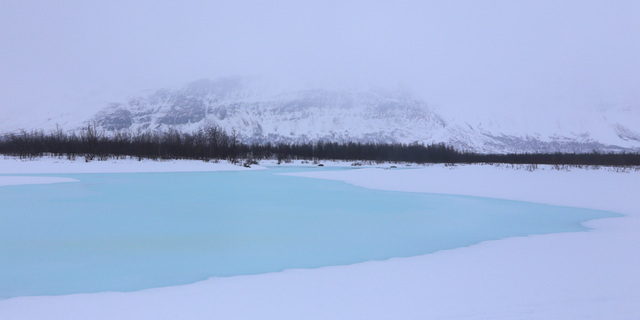 And an hour later the weather hit us on the open lake ice: high winds and heavy rain. SKiing in slush getting soaked by rain. Very Arctic indeed. But the fantastic group just soldiered through in marvellous manner despite some of them being dripping wet down to their base layers. Towards the evening the weather got better for a little while with moments of sunshine and it all felt right again. Once we were pitching camp in the cover of the birch forest showers of wet snow and gusts returned. But by that time we were camped and sheltered, wet but happy. The next day dawned in reasonable conditions as we broke camp and headed towards the big uphill push. 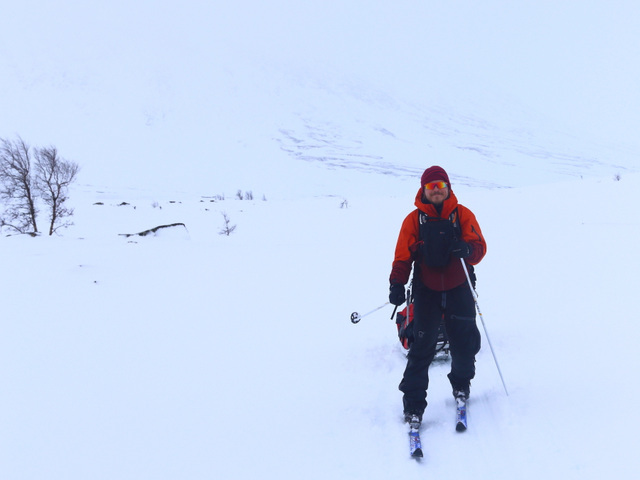 It looked windy higher on the fjells and once we got further up on the shoulder of the Ahkka fjell then wind and snow really hit us. The steep bank requires a push with the heavy loads even in good weather and now we got a little extra challenge on top of that. But once again the group did great. 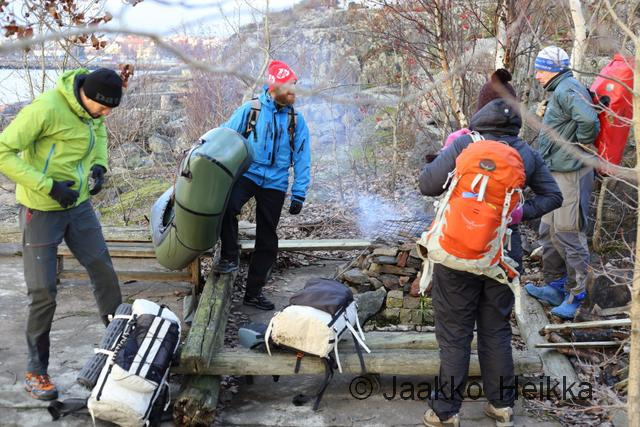 The terrain got easier and we got little protection from the worst of the weather by taking a route down in a ravine. 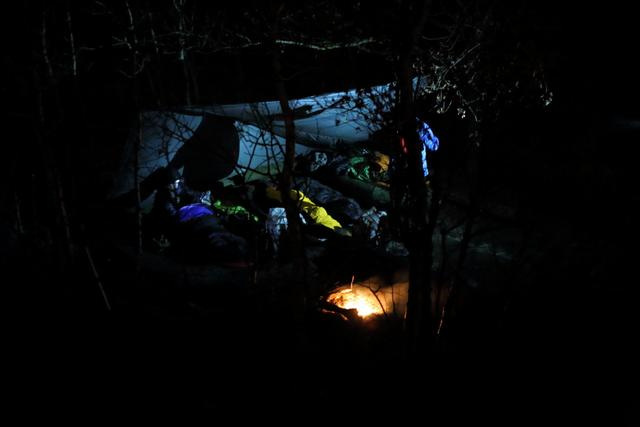 After one more push up from the ravine it was time to set up camp. The third day was probably the best day of the tour weather-wise. 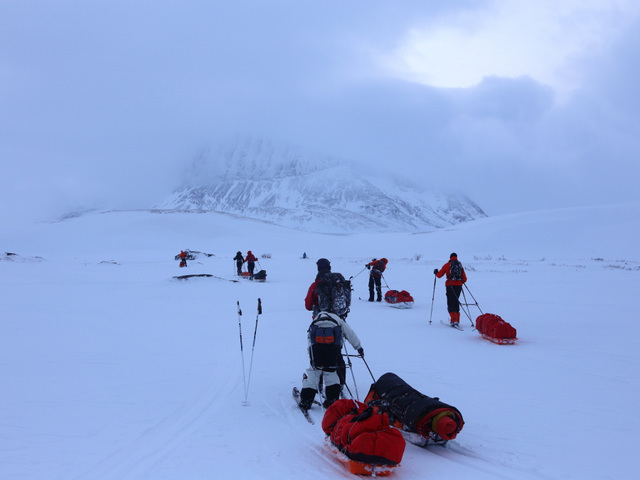 We made good progress but some health issues in the group and a forecasted storm loomed in the back of my head. When we arrived to the point were we had to choose whether we try to do a longer tour and take the shortcut the answer was quite obvious as the latest forecasts warned us about serious storm with wind speeds over 30m/s. 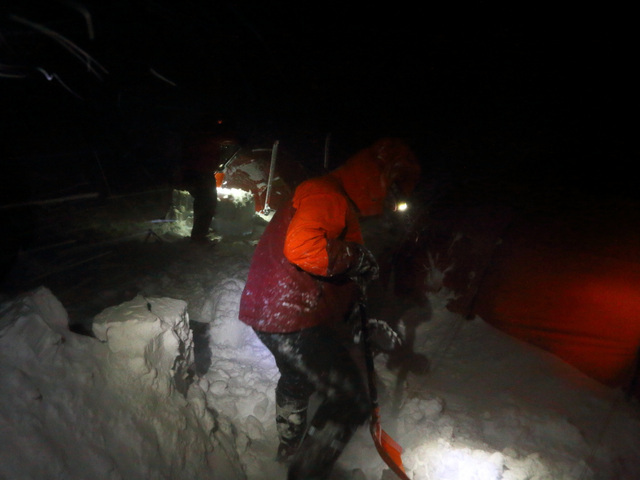 At the end of the day we set up camp and fortified it with some unusually robust snow walls (I rarely bother…) to protect our tents from the predicted high winds. As a bonus I managed to break the leeward main zipper from the Hilleberg Kaitum 3 I was using and after several repair attempts I had to sew the door shut and turn the tent around in the wind and snow… Later in the evening the wind grew into a proper storm and our tents played us the characteristic lullabies of flapping silnylon. 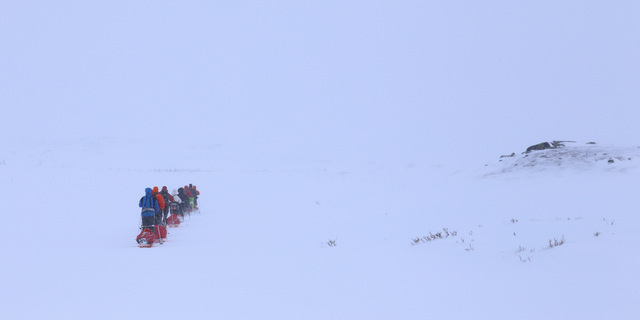 In the morning the weather was still bad and the forecasts predicted even worse weather towards the end of the tour. 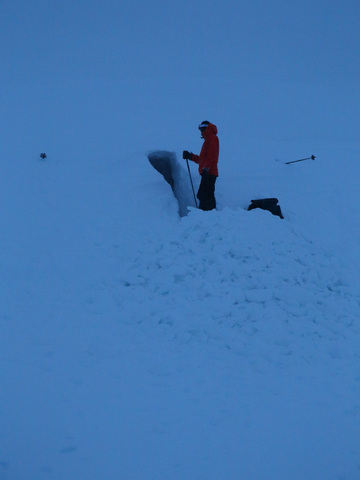 We waited for couple of hours and as the wind died down we broke camp and skied a short stint to a place suitable for digging snow caves. We arrived little late and the group really worked hard to get the snow shelters ready before the dark and soon we were sheltered behind half-a-meter of snow, sipping Jägermeister and trying to get warm in our damp clothing. Our last camp was well protected from the winds but the serious gusts still shooked our tents in the evening and it looked like serious weather up on the fjells as you could hear the wind howling even while camped on the low ground and the fjell tops were all covered in a thick veil of snow rushing through the air. 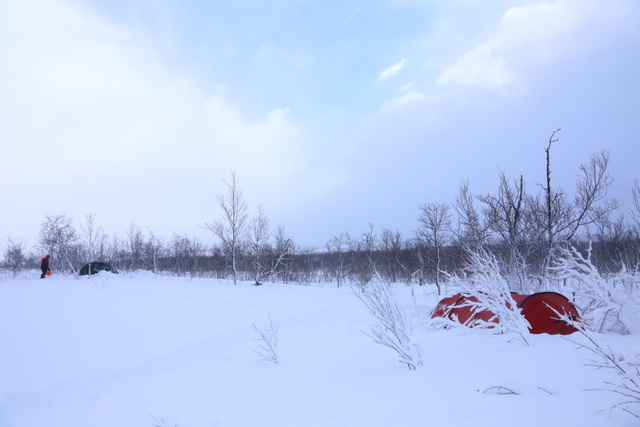 We got our part of the snowfall with about 60 cm of fresh snow covering our tents overnight. 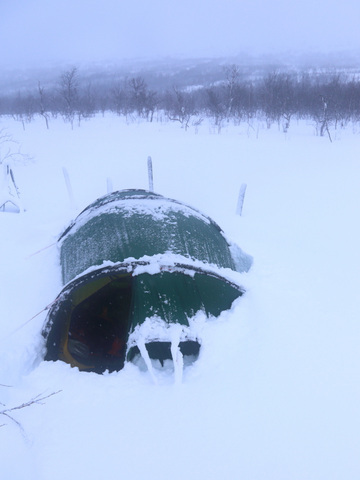 I woke up around 5 a.m. as it was too quiet and noticed my tent was mostly buried under snow muting the characteristic flapping the tent fabric makes in high winds. I was too lazy to get up in the dark and waited until the dawn before getting out for some serious shoveling. 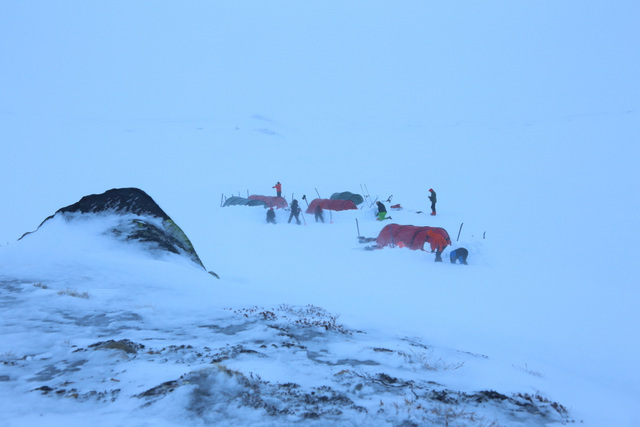 As the weather was supposed to get better in the evening we spent the last day mostly resting in camp wondering the constantly changing weather swinging from sun shine to full-on blizzard every five minutes. It was important to time the calls of nature accordingly. It turned out to be nice and relaxed day fixing equipment, frying bacon and pancakes, listening to iPods, etc. It’s not for everyone but it’s part of the game. Towards the evening the weather got better and after late evening nap we woke in a frost covered tent for the first time during the tour. 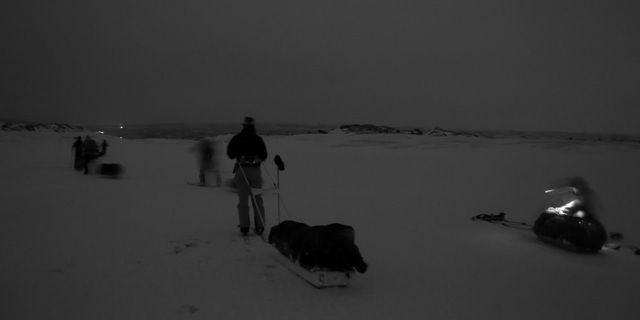 Even though the last stretch towards the lights of Ritsem is always a long one the conditions made it more tolerable: calm, little below zero and partially cloudy letting in some moonlight painting the scenery we didn’t really get to see on the tour. After such an ending it’s always easy to convince yourself that you actually liked it and want to go for another round. Especially after a sauna, dinner and some quality beer in good company. More photos from the tour can be found from my gallery. 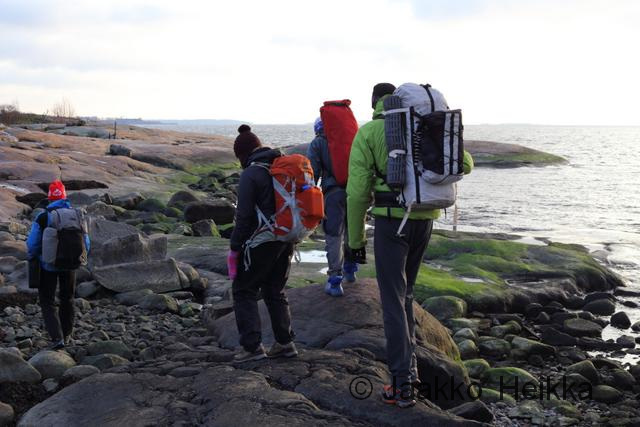 Antti’s trip report from the climate change simulator is also worth reading and can be found from his blog. Highly recommended blog anyway. 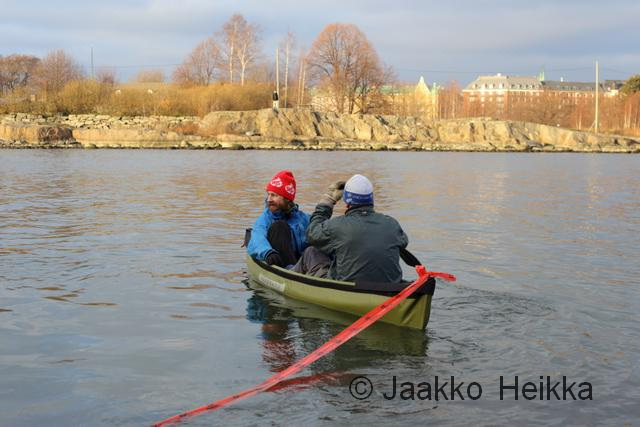 As is his photography work from the Arctic and sub-Arctic at anttihaataja.kuvat.fi.